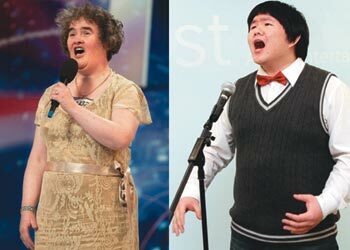 File photos of Susan Boyle and Lin Yu-chun. A Taiwanese shop worker dubbed Little Fatty told of his shock Thursday at becoming a Susan Boyle-like overnight Internet sensation after a flawless Whitney Houston rendition on a TV talent quest. A Taiwanese shop worker dubbed Little Fatty told of his shock Thursday at becoming a Susan Boyle-like overnight Internet sensation after a flawless Whitney Houston rendition on a TV talent quest. Lin Yuqun, 24, last week won over the judges and the audience of the Million Star show with eerily accurate renditions of Whitney Houston& #39;s "I Will Always Love You" -- and has chalked up 480,000 hits on video sharing website YouTube. "I am shocked that I can draw so much attention. I& #39;m really moved and happy that people like my performance of Whitney& #39;s song," said Lin, who works part-time at a musical instrument shop. "I& #39;ve loved singing since I was a little boy and I feel like I am living my dream now. I hope I can pursue a career in singing," he told reporters. TVBS referred to him as "Taiwan& #39;s Susan Boyle", describing him as "plain-looking and short", but Lin, who has the nickname "Little Fatty", told reporters the comparison made him proud. "I am honoured to be compared to Susan Boyle. I am inspired and encouraged by her because she proved that even a person who& #39;s seen as an underdog and who has average looks can shine on the stage," Lin said. Since his performance was posted on Youtube late last week, he has been the subject of heated conversation in on-line chatrooms on American Yahoo! and other foreign websites, it said. "I got goose bumps. Whitney couldn& #39;t do it any better today," a viewer wrote on Youtube. Scottish spinster Susan Boyle shot to global stardom after she was discovered last year on the "Britain& #39;s Got Talent" television show with her performance of "I Dreamed a Dream" from "Les Miserables". The frumpy church volunteer& #39;s first album, "I Dreamed a Dream," was the best-selling debut in British chart history and also topped the US charts.